Much as we might love and admire our parents, we don't really want to turn out like them, do we? 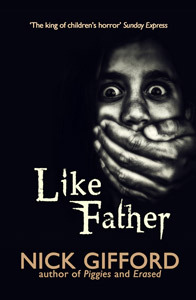 That feeling is even more understandable when your father happens to be a deranged murderer... Danny Smith spends his days trying desperately to keep his family together, and his nights fearing the first signs that his father's madness might be affecting him, too. But what drove his father mad in the first place? This story should bring a whole new meaning to the idea of confronting the family demons! This book features some rather suspect websites and, of course, you shouldn't normally visit these kinds of sites. However, out of the kindness of my heart (or perhaps because I'm a spoilsport), I've negotiated with the owners of these sites and ensured that they're safe for you to visit. www.spirit-talking.co.uk is the home of the ouija chatroom which appears in Incubus, and www.hopespringstrust.org.uk is the home of the alternative community where much of the story takes place.